OHIO VALLEY — Ohio Valley Publishing guest columnist and author Michele Savaunah Zirkle released her second book earlier this week. 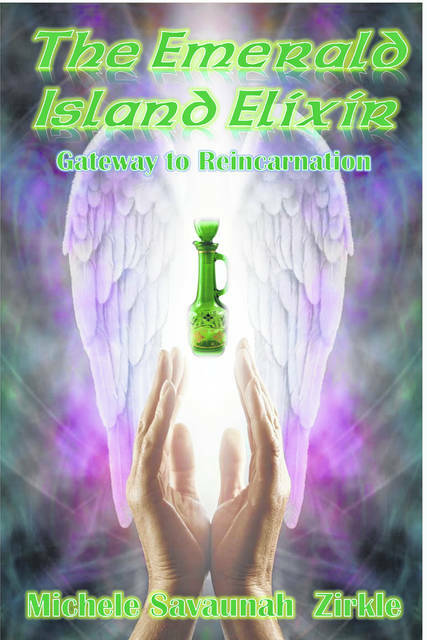 Zirkle’s new book “The Emerald Island Elixir” will be available during this weekend’s Mothman Festival, with the author at the Mason Jar in Point Pleasant on Saturday. “The Emerald Island Elixir is set in Ireland and involves Robert’s attack on Ann and follows his drinking a magic bottle of beer prominently displayed in the pub in Ireland, but visible to only a select few. When Robert dies and travels into the future, returning as Evelyn, a woman healer delivering his own baby, he consults with ‘The White Dove Witchery,’ a secret coven protected by a rebel priest of the Catholic Church, to get a handle on the sporadic power of healing coursing through his veins,” states the synopsis of the book. Zirkle explained the idea for the book began during a trip to Ireland a few years ago. The first three lines came from something heard on the trip, with the book growing from there. “I wish I had stayed dead,” opens the book, drawing in the reader. This book is far different than Zirkle’s first book “Rain No Evil” which was a true story, chronicling the author’s transformation after a brush with evil. The new book ends with the possibility of a sequel, something Zirkle did not rule out for the future. The Emerald Island Elixir is currently available on Amazon and will soon be available through Barnes & Noble. Michele Savaunah Zirkle, PhD in Holistic Healing, MA, BS, is a Life Coach, Reiki Master Healer and Author. After teaching high school for twenty years, Zirkle released her first novel, Rain No Evil. “The River Runs Through my Blood,” took first place in Mountain Ink Literary Journal’s contest, and she has published several vignettes in The Journal of Health and Human Experience and co-authored the anthology, Into the Woods. In addition to hosting a radio show, Life Speaks, Zirkle writes inspirational columns for newspapers, including the Point Pleasant Register, Gallipolis Daily Tribune and The Daily Sentinel. As part of her healing program, she leads group meditations and advice sessions. You can find her at: www.michelezirkle.com and www.EmeraldIslandElixir.com.